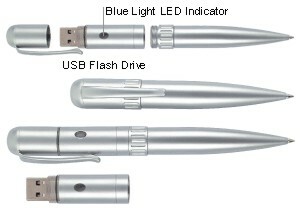 PD32 – 32 MB USB flash drive / memory stick / pen drive with ballpoint pen. The USB drive can be separated from the pen. The rest become a shorter pen as shown in the photo. Packed in a tin box, size: 1/2”x 6”, Max. imprint area: 1/4”x1 1/2”, silver color. Two-year warranty. For pricing on imprinting Click Here. PD128, PD512 – same as PD32 except with 128, 512 MB memory respectively.